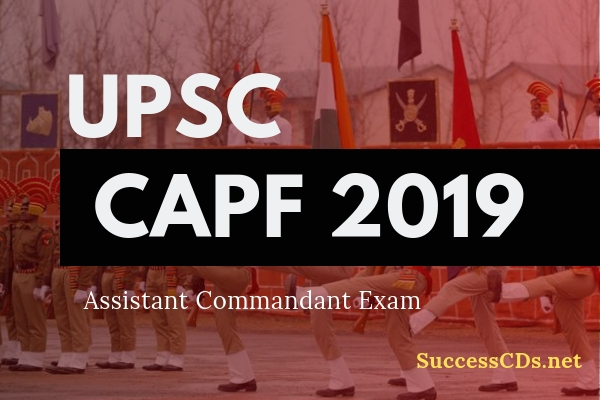 UPSC CAPF Assistant Commandant Exam 2019 (CAPF AC 2019 Exam) - Union Public Service Commission (UPSC) has released a notification on its website regarding Central Armed Police Forces - Assistant Commandants Exam 2019. The notification has been released on UPSC’s website www.upsc.gov.in. Interested candidates should read the eligibility criteria carefully and can apply online. The Online Applications can be submitted online 24th April to 20th May 2019 till 18.00 Hours. The exam will be conducted at various centers across the nation. The Union Public Service Commission will hold a Written Examination on 12th August 2019 for recruitment of Assistant Commandants (Group A) in the Central Armed Police Forces (CAPF) viz. Border Security Force (BSF), Central Reserve Police Force (CRPF), Central Industrial Security Force (CISF) and Sashastra Seema Bal (SSB). No person who is not a citizen of India shall, except with the consent of the Central Govt. signified in writing be appointed or employed under these Rules. Provided that nothing contained in these rules shall debar the appointment, enrolment or employment of a subject of Nepal or Bhutan under these Rule. A candidate must have attained the age of 20 years and must not have attained the age of 25 years on 01st August 2019, i.e. he/she must have been born not earlier than 02nd August 1994 and not later than 01st August 199+. Written Exam: The written examination to be conducted by Union Public Service Commission will be held on 18th August 2019 and will comprise two papers. Paper-I will be held from 10.00 a.m. to 12.00 Noon and Paper-II will be held from 02.00 p.m. to 05.00 p.m. However, if due to any unavoidable situation, he/she submits another/multiple applications, then he/she must ensure that applications, with the higher RID is complete in all respects like applicants’ details, exam centre photograph, signature, fee etc. In case of any guidance/information/clarification regarding their applications, candidature etc. candidates can contact UPSC’s Facilitation Counter near ‘C’ Gate of its campus in person or over Telephone No. : 011-23385271/011-23381125/011-23098543 on working days between 10.00 Hrs. & 17.00 Hrs.